I can hardly believe it's time to think about Thanksgiving, where has this year flown to? I'm sure many of you are busy preparing for all of your guests to arrive, putting finishing touches on your meals. Like you, we have the traditional meal with all the goodies. This year the gathering will be small and intimate. Mr. P loves company, but prefers the groups to be smaller and a bit on the quiet side. Many of you have asked about him, so I'll bring you up to date. For the most part he's doing quite well, much better that I'm home all the time. I think I'm his bit of security. I had worked the other job for so long "thinking" I was doing the right thing, it helped financially to pay for all of his medicines. I was home the month of August and saw a drastic change him, as well as the doctor. I quit my job the first of September and he continues to do well. So, from the bottom of our hearts we thank each and everyone of you for asking. I hurriedly threw together this table late yesterday afternoon. I've been so busy in the shop and elsewhere I totally forgot about a centerpiece for the table. I chose my pheasant and the vintage mercury candlesticks. From our home to yours we wish all of you a Happy Thanksgiving. Lynne I am so glad to hear that you and Mr P are doing so well. For a thrown together table this is lovely. I love it! Have a wonderful Thanksgiving! Your table is stunning, Lynne! I love the warm colors...so inviting! Susan...your salt and pepper shakers stole my heart. The very last thing my husband gave me before he died was an acorn. I wear a silver one around my neck and they always catch my eye. Always will! Simply lovely! Love it all! Have a very Happy Thanksgiving! Gosh, if this is what you do when you're in a hurry - well, I'd want to be a guest at your table anytime. The flatware is elegant and the acorn salt and peppers are cuties! Very pretty table setting! Happy Thanksgiving to you and your family. Glad your friend was able to find the parts to repair your necklace. I can't believe you just threw this together.. you throw very well indeed. It's quit warm and inviting. I loved the pheasant center piece.. Happy Thanksgivings. What a nice warm, inviting table...love the dishes. What a pretty tablescape, and your chairs are beautiful! The flatware is from Walmart?? It's gorgeous!! So glad to hear your husband is doing well. Your pheasant makes a beautiful centerpiece. Sounds like you and Mr. P have much to be thankful for this season. Thanks so much for sharing and Happy Thanksgiving. I love your pheasant as the centerpiece - the perfect fall fellow! Your flatware goes well with the dishes and the acorn S&P are so cute. It must have been a difficult decision to give up your job. I'm glad to hear, Mr. P is doing better because of it. Your table is really wonderful! Love the pheasant. Hope you and Mr. P have a wonderful day. Your home is lovely & I'm happy to read that Mr. P. is doing better. By any chance, was he ever in the service? You can get his meds heavily discounted from the VA if he served in any of the armed forces. Just a thought you might want to check into. Hugs & Happy Thanksgiving to you & yours. Happy Thanksgiving, Darlin'!!! Ohhh...you have set a lovely table, Lynne! 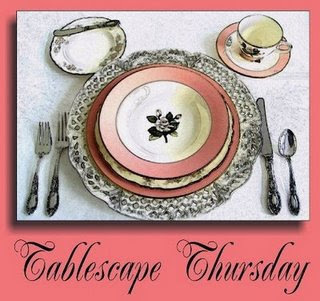 I just adore those pretty dishes with the embossed grapes and leaves...GORGEOUS!!! They certainly do set a beautiful Thankgsgiving table! And you know that I love, love, LOVE that fabulous pheasant...he's sooo regal!!! Thank you for sharing your beautiful table with us, my friend!!! Darlin', I am just so thankful to hear that Mr.P is doing sooo well! Truly one of the best Thanksgiving blessings of all!!! I didn't realize that you had quit your other job but so happy to hear that you are able to stay home! Of course, I know that you shop keeps you plenty busy! Hehe! I'm sooo happy for you, both!!! Lynne, your table looks stunning. Love the pheasant. Happy Thanksgiving! I'm so glad that you brought us up to date on Mr P. I think of you and always hope and pray that you're doing well. I'm glad Mr P is feeling more secure with you being home most of the time. Your table, as always, is stunning!!! Lynn -- a beautiful warm and welcoming table -- glad that Mr. P. is doing so well. Happy Thanksgiving. we are most joyful, with the good report~! yes, that will make your holiday doubly nice, i am certain. a resplendent table, the colors are simply the perfect touch for the harvest... indeed most lovely! Hey Pretty friend! Hope you had a FABULOUS Thanksgiving! I know noone is really back on their computer yet, but when you have a chance, My ETSY is up and running and would love for you to visit...Any feedback from you would be GREAT ADVICE for me...You are the Queen in my eyes...cuz i am CRAAAAZY about your store! You "threw this table together", huh? Well, right on! That's the mark of a true talent who can "throw together" something so nice on the fly! Bravo! Glad to hear your husband is showing improvement and that you are adjusting well to being at home with him. Have a wonderful week!